Description - Sage originated in the Mediterranean basin and was considered to be able to save people from illness and death. Sage grows all over the world in the wild and as garden plants. Effects On The Mind - Sage helps to stimulate and balance the nerves as well as dispels tiredness and depression. It is excellent for aiding memory. Effects On The Spirit - Calming effect useful for clearing away past traumas. 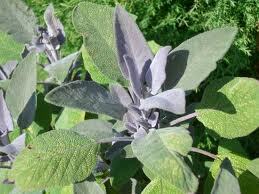 Uses- Sage has been used in cooking, teas, gargles, vinegars, to heal wounds, and for mouth and throat infections. Sage is a mental stimulant and quickens the senses and memory. Blends well with - Allspice, Cinnamon, Nutmeg, Black Pepper, Thyme, Rosemary, Lavender, Pine, and Fir Needle Balsam. Quite a strong oil, so I like to blend it. Great for DIY hair and personal care products. I tend to prefer Clary Sage for everyday use.